Berkeley, CA â€“ 24 October 2011 â€“ Earlier this year, Earthworm Jim creator, Doug TenNapel, stepped into the world of Webcomics when he began sharing RATFIST, his latest oddball action comic, online for all to see. Now for the first time ever in print, Image Comics will be publishing RATFIST in December. Originally conceived of as a possible character that might be featured on Cartoon Network, RATFIST became a daily-updated Webcomic instead! With coloring help from Katherine Garner, RATFIST stars a vigilante-in-tights, satirizing comics, politics, philosophy, and even TENNAPEL himself! 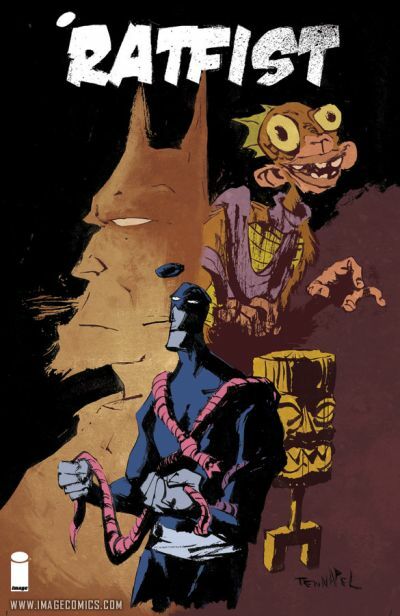 Those that followed along with the daily online RATFIST schedule and new readers alike will be pleased to find that the printed collection will not only include the entirety of TenNapel’s RATFIST story, but also feature a forward written by MST3K/RiffTraxx’s Michael J. Nelson, and fantastic pinups by Ryan Ottley (INVINCIBLE), Skottie Young (Wizard of Oz, Spiderman), Christopher Hastings (Dr. McNinja) and Ethan Nicolle (Exa Cop)! Other graphic novels by TenNapel that were previously published by Image Comics include FLINK, TOMMYSAURUS REX, CREATURE TECH, GEAR, IRON WEST, EARTHBOY JACOBUS, BLACK CHERRY, MONSTER ZOO, and most recently POWER UP. RATFIST TP (OCT110463, ISBN: 978-1-60706-478-7), a 176-page full-color humorous super hero graphic novel for $19.99, will be on sale in stores December 14, and is available for order now in the October issue of Previews. Doug TenNapel is the writer/artist behind a host of successful graphic novels: Ghostopolis, CREATURE TECH, POWER UP, MONSTER ZOO, and GEAR, just to name a few. Doug is also known for his work on television, notably Catscratch (Nickelodeon) and Earthworm Jim. He is also the creator of video games like Earthworm Jim 1, Earthworm Jim 2, and The Neverhood.